Judith is a shining example of lady-Jew badassery. Her name literally means lady-Jew. Assyrian King Nebuchadnezzer sent Holofernes to lay siege to the Bethulia where the Jews quickly lost hope. Judith wasn’t about to let her folks just give up. So she goes and seduces Holofernes in the Assyrian camp, presumably because of her status as widow, then cuts his head off and brings it back to her fam like, “So I brought you this, lets win now plz.” They did. Baglione painted this story twice, around the same time. Although nobody knows the exact year of the second painting it shows a dramatic, and boring, departure from whatever divine inspiration Baglione had for this canvas. In this one, the 1608 version, Judith is watching her back or maybe staring at Holofernes’s feet (y’all know what sleep by the feet means in the Bible amirite? Katsushika Hokusai does a decent illustration of the euphemism) and passing the decapitated head to her seriously freaked out companion. You know what’s happening, this is some character driven drama. In the other one Judith is wearing a shirt and leaning on Holofernes’s head like you might lean against your sibling in a family portrait, ruffling his hair. Her companion is looking off into the middle distance, decidedly not tripping. No wonder it’s still for sale. The boring version may have been an attempt to appease Church sensibilities. Of course the Cardinals weren’t exactly angels themselves, but the Bible goes out of its way to make Judith a woman of virtue. Baglione seems to have other ideas, like Klimt’s Judith in the 19th century, here she’s still undressed and looking more post-coital calm than dear-god-I-just-murdered-a-dude. 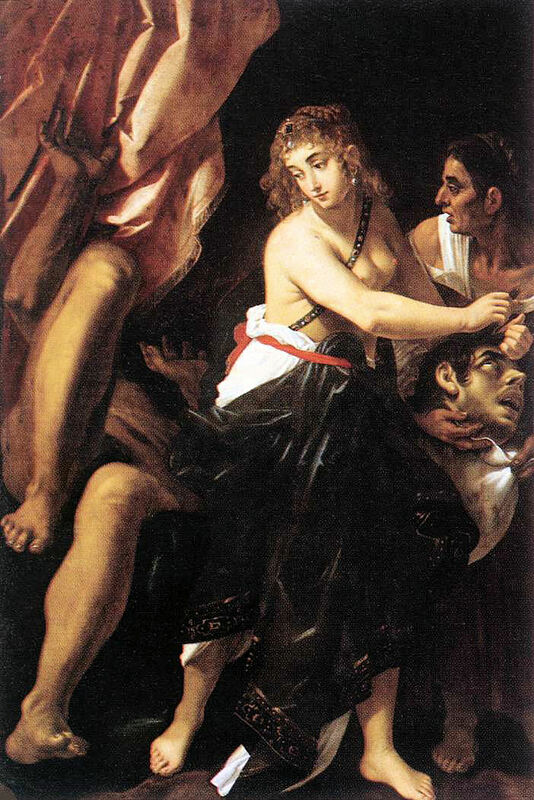 If Cardinal del Monte can staff his house with only cute boys and hide Caravaggio from the law so that the painter can continue making lovers portraits of the house staff then it seems only fair that Judith can have some necrophiliac fun while doing good deeds for her people.